Certification is a key part of organic production. In Canada, it ensures that organic products follow the Canadian Organic Standards, which are mandatory for organic products sold across provincial or national boundaries, or that carry the Canada Organic Logo. Third-party certification bodies (CBs) make sure organic producers follow the standards. They are regulated by the Canadian Food Inspection Agency (CFIA), which maintains a list of approved organizations in Canada. There are seven certifying bodies currently providing services in Ontario — but not all of these inspect producers. Certification takes time and money. There are several steps to organic certification, which are important to consider thoroughly, in advance. Transitioning to organic production can take from 15 to 36 months. During this time, products cannot be sold as organic. Producers must also pay for one year of pre-certification, and renew annually. So is certification expensive? It’s certainly not the largest cost of organic production, but those considering it should do their research to find the best fit. Services and prices vary widely, depending on the size and type of operation, making it a challenge to clearly assess the costs of certification. Generally, certification costs do not contribute significantly to the consumer cost of organic food. In fact, they can be comparable to food safety program costs for producers (such as CanadaGAP, which can cost more than $500 per operation). But that doesn’t mean that certification isn’t a financial concern for farmers. 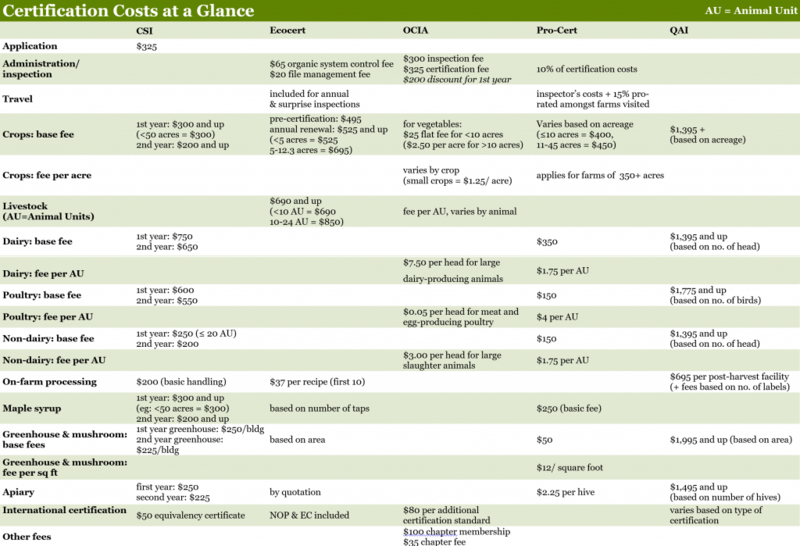 For smaller farms that produce a range of products, certification costs can add up, as each category of product (such as field crops, livestock, maple products and honey) means additional fees. And farmers must re-certify each year. Each certifying body has a different fee structure and offers different services, making direct comparisons difficult. A closer look at the costs of certification, however, can give producers a better sense of where they might find the best fit. In early 2018, we consulted with several CBs to get a sense of the real costs of certification. 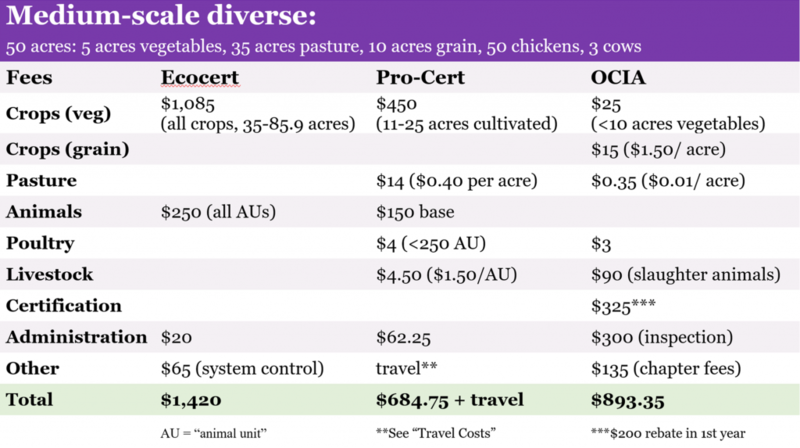 We compiled the data to show how rates and services can vary, depending on the size and type of farm in question. Please Note — Not all fees may be up to date for 2018, and prices do not include HST. Additional fees for administration or travel may vary dramatically, and specialized certificates or international equivalency also cost more. Flat-fee structures may prove simpler to work with, but may not be cost-effective for every operation. Changing the mix — and scale — of production also changes the fee structure, so farmers planning for growth should consider this when choosing a certifying body. In many cases, small producers (10 acres or less) can certify for less than $1,000. About one third of respondents to OCO’s 2017 sector-wide survey paid between $600 and $900 annually for certification. For farms under 10 acres, more than half paid less than $600. For very small operations whose owners don’t plan to sell their products outside Ontario, Pro-Cert’s “local organic” designation may be a viable option, with a base fee of $300. Pro-Cert calls the program “COR ready” in that it is not a federally recognized program (i.e. producers do not get an organic certificate and cannot use the Canada Organic Logo), but prepares operators for a smooth transition to full certification once they grow beyond 10 acres or wish to sell inter-provincially. To do so, they need to be compliant with federal standards and pay for annual inspections under the normal certification fee structure. Similarly, Ecocert offers a flat-rate $525 certification option for farms that are under five acres and have fewer than six animal units. Unlike Pro-cert’s Local Organic designation, this certification is compliant with national standards. We asked certification bodies to provide estimates for four different farm scenarios. Three provided enough information for us to develop an overview of certification costs. Please note that these are estimates and do not necessarily reflect actual farming conditions. They are meant to illustrate some of the costs of certification in Ontario, but may not include all costs, such as administrative fees, hourly rates or on-farm packing/processing inspection fees. These estimates do not include HST. Note: for this scenario, Ecocert typically prepares client quotes on a case-by-case basis. Most of the certifying bodies in the above comparison work the cost of the inspector’s travel in to their administration fees. Pro-cert does not – they ask the farm being certified to share the cost of travel with the other farms being inspected on that trip. 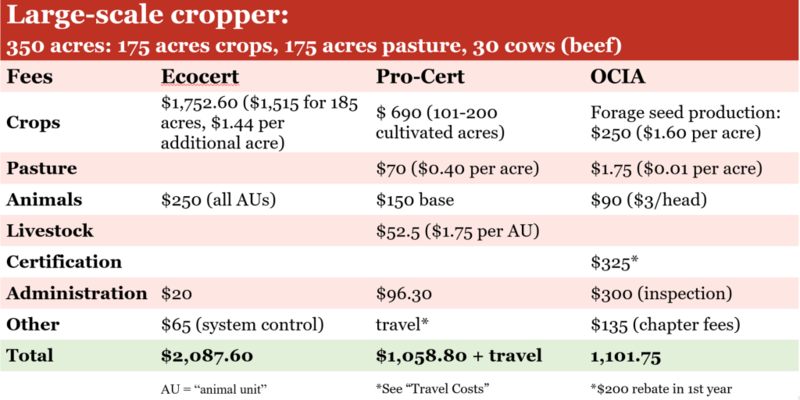 This can mean that the cost of certification through Pro-cert can vary widely, depending on the farm location. Their formula for travel costs is as follows: client pays cost plus 15% on a pro-rated (shared) basis for vehicle (currently $0.55/km), meals and accommodations provided that applicants make themselves or an authorized representative available at a time convenient to the inspector. For special trips, client pays the full travel cost, plus $85/hr for the inspector’s time. There is no such thing as a straightforward or direct comparison of certification fees. Different certification bodies price and operate differently, and may offer niche services or appeal to specific sizes or types of farms. You may also want to talk with certified organic farmers in your area — or whose operations are similar to your own — to get a better sense of what to expect and how to prepare for certification. Or, you could consider working with an organic consultant who has expertise on certification, to help you navigate the process. Additional resources, such as the Canadian Organic Growers’ list of questions for certification bodies or the Ecological Farmers Association of Ontario’s Advisory Service, can help with your research. 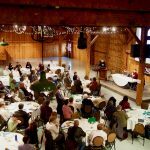 The Ontario Ministry of Agriculture, Farming and Rural Affairs also provides resources on transitioning to organic production.